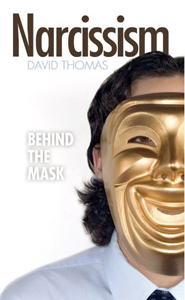 Narcissism: Behind the Mask - book by David Thomas PhD. Narcissists avoid interactions with people who threaten to expose their inflated and false self-image! Narcissism: Behind the Mask looks at narcissists and their codependent supporters by looking deeply into their psyches. If you are a non-narcissist, this book will open your eyes to how you might be being controlled and manipulated. One of the best selling books on the subject of narcissism. The Hardback and Paperback versions are now all sold out. Click here to read an extract from the book - an argument between a typical narcissist and his wife, with analysis of what is said. It's an interesting read for students of the subject and useful for anyone who has concerns about a relationship, work colleague, parent. This one presents narcisissm as it is and how it affects all around. After dealing with a couple of Psychologists who where as much good as a Chocolate Teapot, this book was a breath of fresh air. It gave me back my sanity, sure I was angry and if truth be told embarrassed, I recognised myself as someone who suffers from low self esteem. The Narcissists identified this and took advantage of my weakness. At the time I never understood how a community could turn against me, after reading this book I now understand the dynamics of the relationship. Be very careful who you make friends with, you may end up in a toxic relationship. The end of the book covers children and the material world we live in. My own grandson was brought up in a nursery, at age five he has his tantrums. He cannot go out to play as all the other children are in the house with their xbox's etc. Thanks to David Thomas it's time for a rethink on my grandson's activities. I will certainly purchase his other books and of course I follow him on Twitter. Excellent read. I consumed it in two days. Extremely helpful in everyday life for anyone who is dealing with narcissism. Great book! Very interesting! So nice to read about the controlling ways of the narcissist and understand that it is a condition set in some people. With knowledge and understanding one gains strength. 5.0 out of 5 stars An excellent, eye-opening read! This is a fantastic book that highlighted to me personalities that I have seen over and over again since childhood! It explains how patterns of behaviour in narcissists develop as a result of their family background but moreover, it opened my eyes to how it affects all of us, transcending social, cultural, linguistic and national divides. In addition, it focuses on narcissism in a work environment, an area in which it is difficult to deal with such personalities given the inherant hierarchical structure. This book helped me to reconsider the relationships I hold with those around me, and has helped me to come to terms with the difficulties I have been presented with in the past by those with clear narcissistic tendancies. A fascinating read! I have read several other books on narcissism, but this one is the best. It describes how the family background can impact on the development of narcissistic individuals and distinguishes between healthy and unhealthy narcissism. There are various examples of unhealthy or malignant narcissists, including business and political leaders. The book also points out that all of us are narcissistic to some degree and describes how our environment can have a significant influence on our behaviour. The author's claim that the book gets behind the mask of the narcissist is justified. There are various anecdotes and cases relating to individual unhealthy narcissists who have engaged in bullying or character assassination and the subsequent analyses of their behaviour are then related to their past, their childhood and upbringing. The book then goes on to examine how narcissists are not trustworthy and how they sabotage different types of team. It also investigates how they exploit the natural desire of people to trust others by targeting vulnerable individuals and, over time, influencing the way they think about others and therefore how they behave towards them. Overall, I found it to be a very thought provoking and informative book. The book contains much of the information on the Narcissism pages of this Web site in Chapters 2 to 5, revised and expanded where necessary and augmented by anecdotes and case studies, and much more. The following are examples of the feedback received from readers of this Web site. "Thank you, thank you, thank you. Great knowledge." "Wow!!!!!!!!!!!! Absolutely by far the most extensive, well written, documentation pertaining to narcissism in the work place. Congratulations!" "... I am so excited that someone has described the situation I deal with daily." "I'm currently coping with a narcissistic boss and I find your site extremely helpful and well organized. I don't really have enough words to express my gratitude..."
"... Narcissism in the workplace has many outward manifestations to confirm the addictive "I am the BOSS" syndrome that causes the workplace bullying and harassment cases that your web site explanations help to expose. Thanks." "An friend of mine recently took his life. Since then I have wondered why. Your concise, easy to understand, discussions on narcissism provided me with the answer. thank you." Introduction: introduces the concept of early mistreatment by parents and how it can damage a child emotionally, possibly for life, using Hitler and Stalin as examples; then introduces the themes of the individual chapters. Chapter 1: gives examples of narcissistic behaviour and how codependents adapt their own behaviour to accommodate it. Uses Philip Zimbardo's Stanford University prison study as an example of how environmental influences can cause the behaviour of 'normal' people to change. Chapter 2: develops an understanding of narcissistic behaviour and how to recognise it using several anecdotes. It distinguishes between normal or healthy narcissism on the one hand and malignant or pathological narcissism on the other. Chapter 3: describes the behavioural characteristics of codependent individuals; for example, how they experience boundary distortion and are unable to discern where their own person stops and that of others begin. Chapter 4: relates to how narcissism and leadership are inextricably linked due to the overwhelming need of the narcissist to be in control. To be in control he or she must be the leader of the group. Chapter 5: explains why teamwork is important. Humans are social beings that need to interact with others. The narcissist knows this and uses this need to his advantage by typically infiltrating the team, undermining the leader's position and then assuming the leadership position himself. Chapter 6: describes the real life case of a senior management team in an architectural consultancy organisation, and their recent managerial failures. The human failures are identified and linked to one narcissistic senior management team member, but it is not possible to understand what drives the narcissist's self-defeating behaviour as the individual charged with investigating failures does not have knowledge of the life histories of those involved. Chapter 7: uses another real life case of team members from the senior management team of an engineering service company. Having identified in the previous chapter that it was only possible to draw tentative conclusions based on the symptoms evident from the behaviour of narcissistic team members, this case uses more in-depth analysis of the actual words spoken by the narcissist and his codependent collaborator, and reveals strong links to their life histories. Chapter 8: looks at the trustworthiness and loyalty of narcissists and how they exploit the natural desire of people to trust others. Chapter 9: describes narcissism from a moral and ethical viewpoint and evaluates how individual behaviours shape their capacity to lead a happy and fulfilled life. Chapter 10: examines how happiness can be achieved based on what some of the great philosophers have written, and how narcissists and codependents often make decisions that are in their own short term interests, but work against their longer term happiness. Chapter 11: examines how the behaviour of the parents influences the character of their adolescent and adult children. Anecdotal evidence of outcomes is used such as Brian Blackwell who killed both his parents with a claw hammer and a carving knife. Chapter 12: examines how we can improve our children's prospects and avoid creating narcissistic individuals through better parenting and by using the Socraterial approach of self-examination. Do you really want to understand how the mind of the narcissist works, what causes the triggers, how he (or she) uses distortion, denial and deception to win arguments, how the narcissist preys on your own insecurities to make you feel inferior? Narcissism: Behind the Mask takes you on a journey to look deeply into the psyche of narcissists and their codependent supporters. To deal with a narcissist, you first need to understand him. Armed with this knowledge, the book then gives you the means to gain or re-gain true happiness and love. Sounds like a no-brainer… but many of us actually do! That makes us codependents and them power-hungry narcissists. As they trample over us in their quest for self-aggrandisement and we find ourselves dragged into an unhealthy parasitic relationship with them, our lives can become utterly miserable and feel out of control. This book shines a light on the reasons why narcissists are like they are, and on the pain and suffering they inflict on the codependents around them - and, more importantly, it shows how both can move towards winning back control and regaining happiness in their lives.